Social epidemiology is the study of the causes and distribution of diseases. Social epidemiology can reveal how social problems are connected to the health of different populations. These epidemiological studies show that the health problems of high-income nations differ greatly from those of low-income nations. Some diseases, like cancer, are universal. But others, like obesity, heart disease, respiratory disease, and diabetes are much more common in high-income countries, and are a direct result of a sedentary lifestyle combined with poor diet. High-income nations also have a higher incidence of depression (Bromet et al. 2011). In contrast, low-income nations suffer significantly from malaria and tuberculosis. How does health differ around the world? Some theorists differentiate among three types of countries: core nations, semi-peripheral nations, and peripheral nations. Core nations are those that we think of as highly developed or industrialized, semi-peripheral nations are those that are often called developing or newly industrialized, and peripheral nations are those that are relatively undeveloped. While the most pervasive issue in the U.S. health care system is affordable access to health care, other core countries have different issues, and semi-peripheral and peripheral nations are faced with a host of additional concerns. Reviewing the status of global health offers insight into the various ways that politics and wealth shape access to health care, and it shows which populations are most affected by health disparities. Improvements in technology and reduced family size have led to a reduction of work to be done in household production. Unhealthy market goods, including processed foods, sweetened drinks, and sweet and salty snacks are replacing home-produced goods. Leisure activities are growing more sedentary, for example, computer games, web surfing, and television viewing. More workers are shifting from active work (agriculture and manufacturing) to service industries. Increased access to passive transportation has led to more driving and less walking. Obesity and weight issues have significant societal costs, including lower life expectancies and higher shared healthcare costs. High-income countries also have higher rates of depression than less affluent nations. A recent study (Bromet et al. 2011) shows that the average lifetime prevalence of major depressive episodes in the 10 highest-income countries in the study was 14.6 percent; this compared to 11.1 percent in the eight low- and middle-income countries. The researchers speculate that the higher rate of depression may be linked to the greater income inequality that exists in the highest-income nations. In peripheral nations with low per capita income, it is not the cost of health care that is the most pressing concern. Rather, low-income countries must manage such problems as infectious disease, high infant mortality rates, scarce medical personnel, and inadequate water and sewer systems. Such issues, which high-income countries rarely even think about, are central to the lives of most people in low-income nations. Due to such health concerns, low-income nations have higher rates of infant mortality and lower average life spans. Globally, the rate of mortality for children under five was 60 per 1,000 live births. In low-income countries, however, that rate is almost double at 117 per 1,000 live births. In high-income countries, that rate is significantly lower than seven per 1,000 live births. The most frequent causes of death for children under five were pneumonia and diarrheal diseases, accounting for 18 percent and 15 percent, respectively. These deaths could be easily avoidable with cleaner water and more coverage of available medical care. The availability of doctors and nurses in low-income countries is one-tenth that of nations with a high income. Challenges in access to medical education and access to patients exacerbate this issue for would-be medical professionals in low-income countries (World Health Organization 2011). Social epidemiology is the study of the causes and distribution of diseases. From a global perspective, the health issues of high-income nations tend toward diseases like cancer as well as those that are linked to obesity, like heart disease, diabetes, and musculoskeletal disorders. Low-income nations are more likely to contend with infectious disease, high infant mortality rates, scarce medical personnel, and inadequate water and sanitation systems. According to the World Health Organization, what was the most frequent cause of death for children under five in low income countries? If social epidemiologists studied the United States in the colonial period, what differences would they find between now and then? What do you think are some of the contributing factors to obesity-related diseases in the United States? 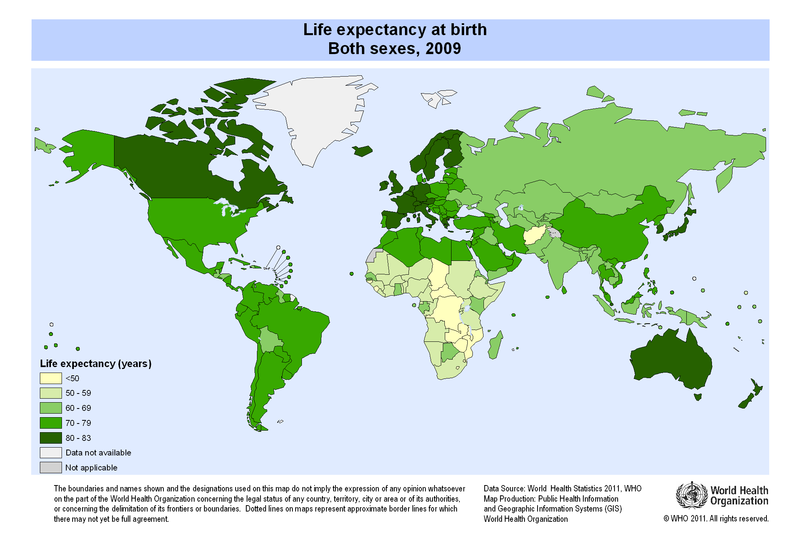 Study this map on global life expectancies: http://gamapserver.who.int/mapLibrary/Files/Maps/Global_LifeExpectancy_2009_bothsexes.png. What trends do you notice? Bromet et al. 2011. “Cross-National Epidemiology of DSM-IV Major Depressive Episode.” BMC Medicine 9:90. Retrieved December 12, 2011 (http://www.biomedcentral.com/1741-7015/9/90). Huffman, Wallace E., Sonya Kostova Huffman, AbebayehuTegene, and KyrreRickertsen. 2006. “The Economics of Obesity-Related Mortality among High Income Countries” International Association of Agricultural Economists. Retrieved December 12, 2011 (http://purl.umn.edu/25567). Organization for Economic Cooperation and Development. 2011. Health at a Glance 2011: OECD Indicators. OECD Publishing. Retrieved December 12, 2011 (http://dx.doi.org/10.1787/health_glance-2011-en). UNICEF. 2011. “Water, Sanitation and Hygiene.” Retrieved December 12, 2011 (http://www.unicef.org/wash). World Health Organization. 2011. “World Health Statistics 2011.” Retrieved December 12, 2011 (http://www.who.int/gho/publications/world_health_statistics/EN_WHS2011_Part1.pdf).